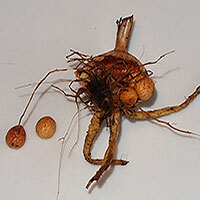 It is possible to propagate most varieties of plants that grow from bulbs, corms and tubers from collected seed. However, such plants grown from seed can take many seasons to mature and reach flowering size, and may not exhibit the same properties as the parent cultivar, as the flowers can easily become cross-fertilised. If the parent bulbs are planted under the correct conditions (position, depth and soil requirements) for their species, they will often multiply themselves without any help. 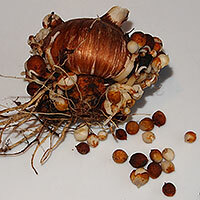 Many varieties of bulbs and corms have the ability to develop 'offsets' underground. Offsets (also called bulblets or cormels) are daughter plants that grow on the side of the parent plant. They are produced asexually from the parent so will be natural clones of the original bulb or corm - sharing the same characteristics. Eventually these offsets will develop into full size flowering plants themselves, usually within two or three seasons. Good examples of this are tulips, alliums, crocosmia and autumn crocus (colchicum). 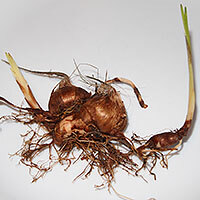 To propagate from bulbs that form offsets, such as tulips, narcissus and the larger varieties of alliums, you should wait until the plants are dormant (finished flowering and the leaves have died down). Once this has happened, you can dig up the bulbs, rub away the dried outer layer of skin, and gently pull away the offsets. You can do the same for corms, such as gladiolus and crocosmia, again by lifting the corms when the plants are dormant and pulling away the tiny cormlets. As the tiny bulbs and corms are also dormant at this point they will not grow-on until the growing season starts again, so they should be stored in cool dry conditions until the normal time for planting begins for that species. When this occurs the offsets can be planted up in gritty compost or free draining soil (in pots or in a nursery area) until they reach normal flowering size. They will also need regular feeding and watering to ensure they grow to their full potential. Young shoots of Allium giganteum bublets emerging in spring. 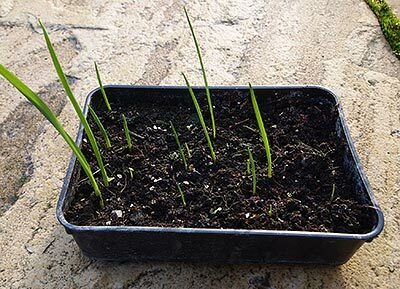 Clump forming bulbous plants such as Snowdrops (Galanthus) and Chives (Allium schoenoprasum), which readily increase by offsets, can be easily propagated by lifting and dividing the clump once flowering is finished but the leaves are still in the green stage (not withered away). In fact the action of lifting and dividing these plants helps to maintain their vigour.